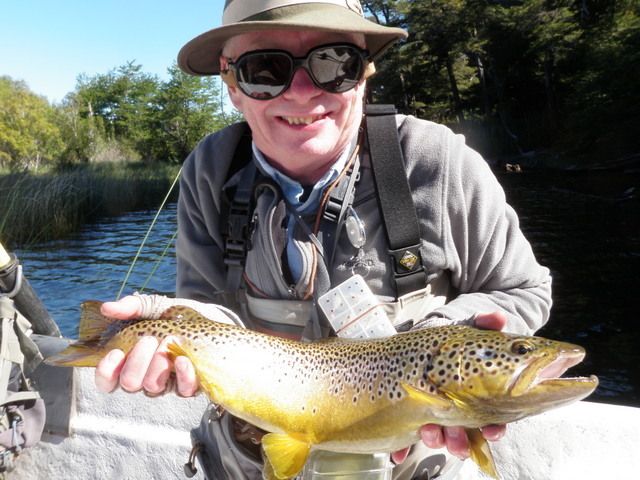 Jane and I certainly enjoyed the scenery and outdoor activities during our visit to Argentina, but one of the more lasting impressions was the food that delighted our palates. 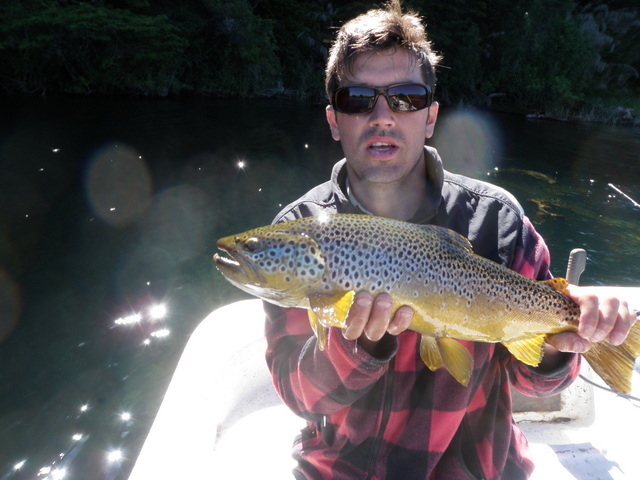 Of course we read about the Malbec wine and delicious steaks of this South American country, but we were surprised by the variety of other dishes that left a favorable impression on us besides the meat and wine. As we spent hours waiting for flights on our return trip, we came up with the idea to have an Argentine Christmas dinner. Amy and her boyfriend Joe would be home for Christmas as well as Dan, and we felt it would be fun to share our new discoveries with our kids. The first step was developing a menu, and in no time we pulled one together. For appetizers we planned paired figs and bite sized ham similar to the tasty toothpick connected treats that were served at Rio Manso Lodge. In addition we planned on some non-Argentine favorites such as pita bread with hummus and peanuts and crackers. Since Amy is vegetarian we planned our first course to be empanadas, both vegetable and meat, followed by some stuffed pumpkin. The main dinner would then be a small asado with chicken and chorizo and grilled vegetables, and for dessert we envisioned coffee flan. 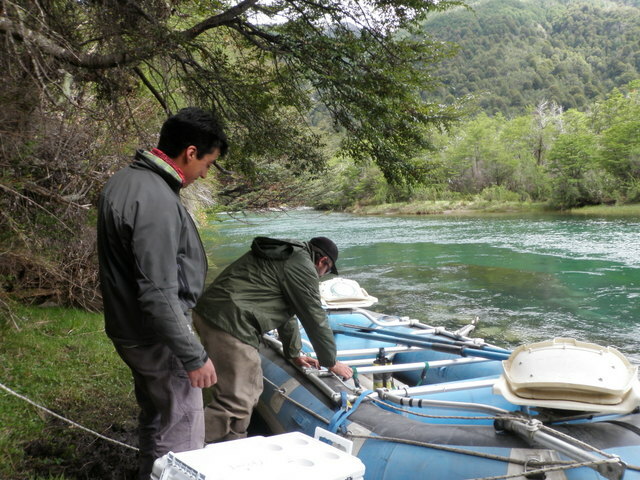 There would also be chimichurri sauce for the meats since we loved the sauce prepared by the kitchen staff at the Rio Manso Lodge. Now our plan was formulated, and we needed to execute. Several days before Christmas Jane and I made a trip to Lowe’s Mercado, a Mexican supermarket on Coflax Avenue within five miles of our house. We purchased chili powder, plantains, chorizo, empanada discs, sofrito, and fresh produce. In addition we visited King Soopers and bought some of the standard items that we use in our normal food preparation. A late addition to our Christmas dinner was an ice globe as Jane spotted a kit while we were shopping at City Floral and couldn’t resist buying it. We had the necessary materials to make six ice globes, so we experimented with one a week before Christmas and discovered that success was not a foregone conclusion. We allowed the orb to freeze too long and ended up with a globe-shaped solid chunk of ice. We learned from this experience, however, and created a second successful globe several days before Christmas. All we had to do was prevent our novel Christmas decoration from melting, and we had a unique centerpiece for our Christmas dinner. 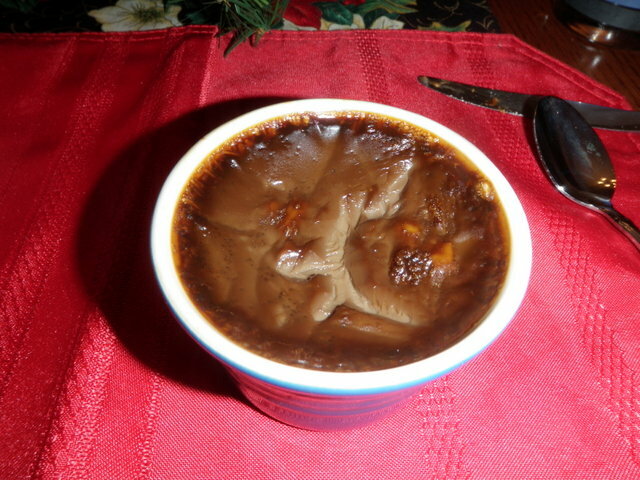 On Christmas Eve Jane worked on the flan and made eight cups and placed them in the refrigerator to chill. It was reassuring to have one of our menu items essentially completed before Christmas day. 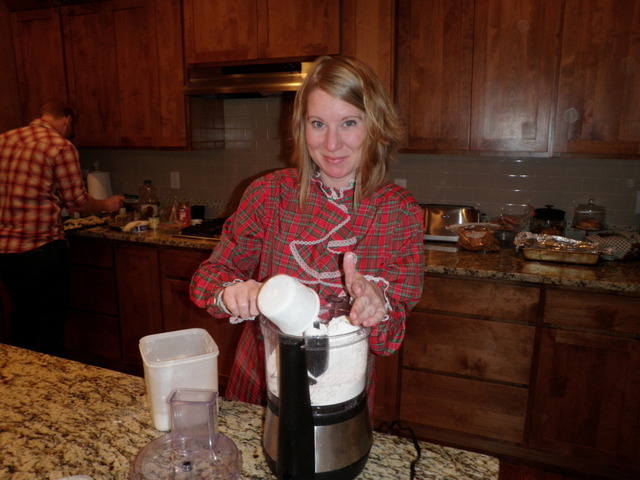 We also scheduled to make the empanada fillings, but the weather in Denver was so warm and balmy that we couldn’t resist doing fun activities outdoors, so we delayed Christmas dinner preparation until Christmas Day. On Christmas morning we followed our normal routine and opened gifts and enjoyed breakfast burritos. Amazingly this lasted until 1:30 in the afternoon unlike Christmas when the kids were young when presents were ripped open in a matter of two hours or less. By 3PM there was no room for delay so we pulled out all the required ingredients and began food preparation in earnest. 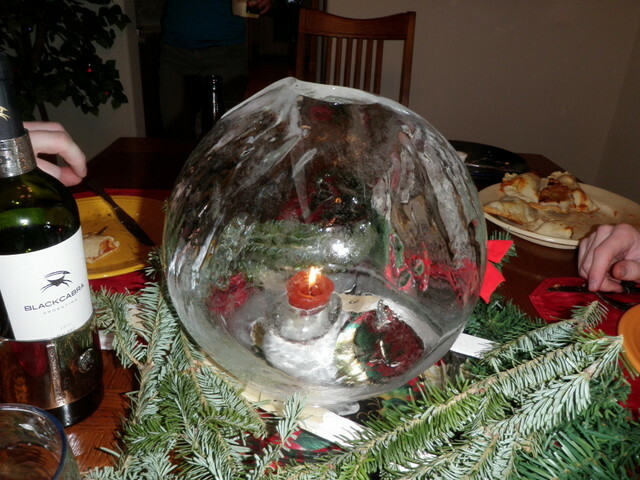 Our second ice globe was more successful than the first as we removed it from the freezer before it froze solid. The outer shell was a nice thick 1/2 inch wall, and we managed to keep it frozen for the day or two between creation and Christmas dinner. The hollow orb with the glowing candle in the center served as an extraordinary centerpiece on our Christmas dining room table. 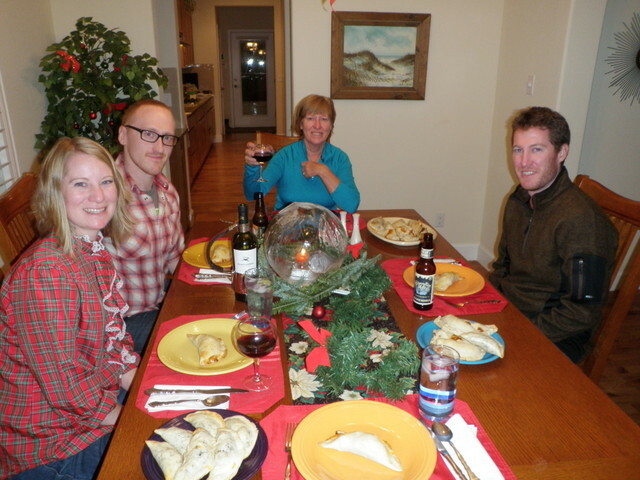 Empanadas were a big hit and probably represented the most popular menu items. Amy and Dave began the project; but as the recipe moved along, Amy became the mainstay, and Dave gradually converted to grilling while Joe assumed empanada fill and seal duties. 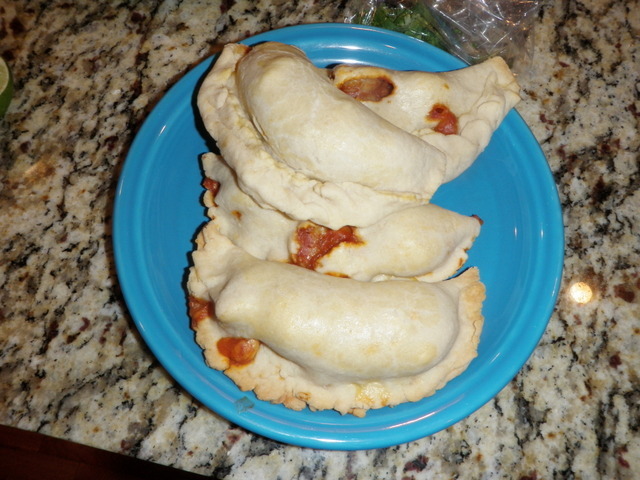 The team made eight black bean and plantain pockets using the frozen Goya dough purchased at the Mexican supermarket, but it quickly became apparent that there was not enough dough to finish the shrimp versions. Amy was the hero, however, as she whipped together a dough recipe that enabled eight shrimp empanadas to appear, and then she used up the remaining dough to create improvised empanadas using leftovers from breakfast. Dave had purchased ingredients for a third type of doughy treat that used tofu, a potato, pepper and onion, but he was unable to find the source recipe. At any rate all versions were consumed, and leftovers fueled the family for several additional breakfasts and lunches. 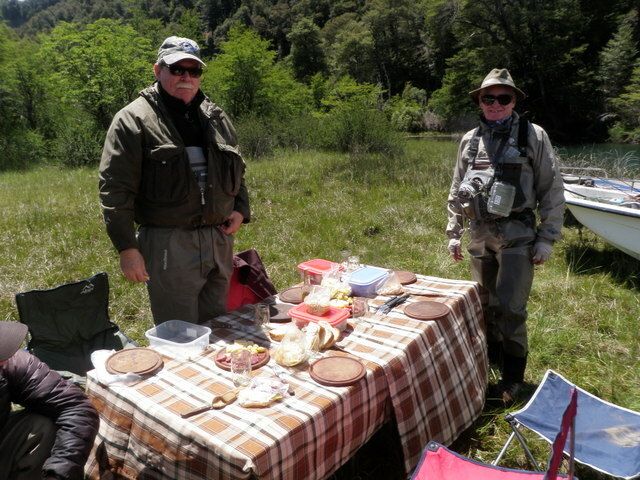 The stuffed pumpkin or squash was also tasty, but it was different from the menu item that Jane and Dave enjoyed during their last lunch at Rio Manso Lodge. 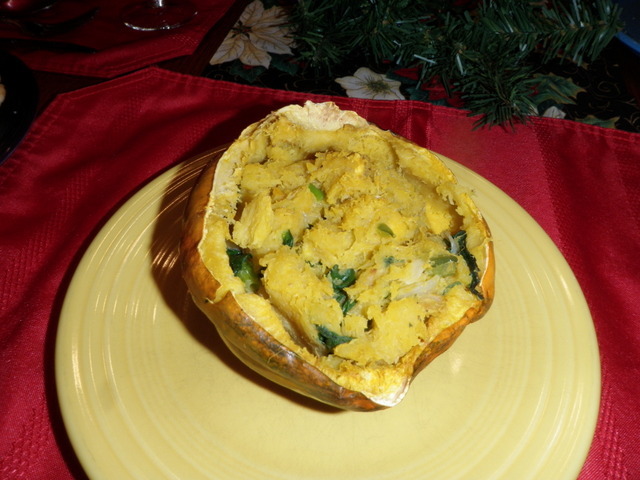 The Christmas version involved scooping out the squash flesh and mixing with fresh onion and cilantro and then reintroducing the filling to the hollowed out squash bowl before baking. The version in Argentina had a mix of various vegetables in a thick relish that was placed in the pumpkin without scooping out the pumpkin flesh. As we ate the filling we combined it with the squash. Dan fired up the charcoal grill and placed the Himalayan salt block along the edge and then gradually shifted it over the fire until it was sizzling hot. The first things to be placed on the grill were the grilled vegetables. 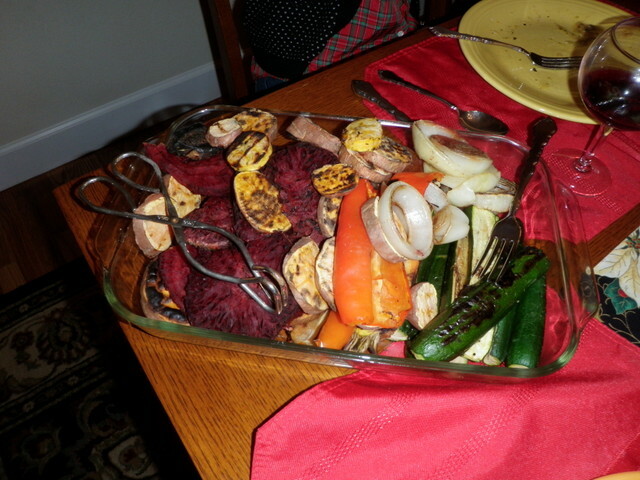 Like our Argentine asado, we had zucchini, sweet potatoes, onions, and peppers, but we added beets and carrots. Unfortunately the beets and carrots were stored in our downstairs refrigerator which cannot be adjusted appropriately and freezes contents in the refrigerator side. We sliced the frozen beets and carrots and placed them on the salt block, and these items immediately thawed and then sizzled and crisped. We sequentially added the other vegetables and grilled them as well. The grilled vegetables were quite tasty although the beets absorbed a huge amount of salt due to their mushy state. Joe and Dan loved them although some of the family members felt they were too salty. 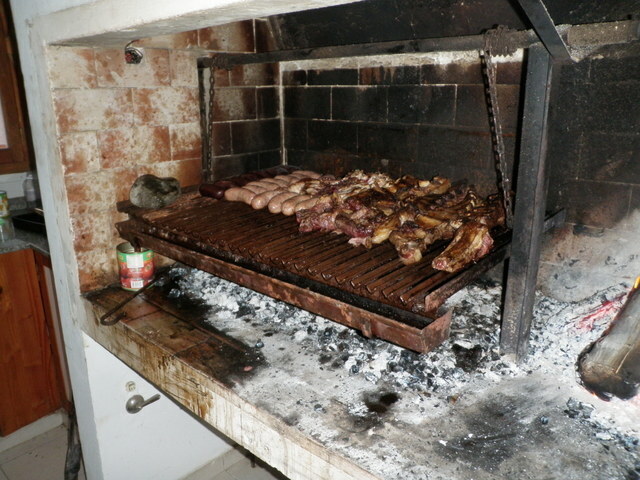 The next stage of the asado was to grill the steaks, chicken and chorizo. These items turned out to be quite good, but we overestimated our appetites and had to eat our Christmas dinner in two separate stages. By the time we ate two or three empanadas and a stuffed pumpkin on Christmas, we were too bloated to eat the main course so we decided to grill only the chorizo and save the other meats for a later meal. The chorizo turned out to be the least popular item on the menu. 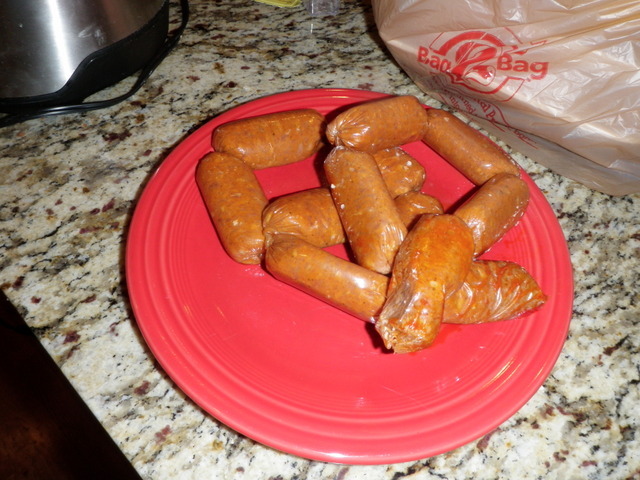 The small sausage links were extremely fatty with a thick casing. They flamed up immediately in the hot fire and turned an unappetizing black color. The casing was too thick to eat, so we peeled it off and ate the meat within which proved to be crumbly and quite salty. Between the beets and the chorizo we probably consumed our weekly quota of salt in one meal. The last item on the menu was the coffee flan, and this was a big hit. Even though we didn’t have room for meat, we had plenty of room for the sweet coffee flavored flan that melted in one’s mouth. Jane’s flan was every bit as good as the dessert I enjoyed at Rio Manso. As mentioned earlier we ate empanadas, stuffed pumpkin and flan and snacked on a small portion of grilled vegetables and then saved the rest as leftovers. On Thursday evening we were dinner guests at the home of some friends, so the first opportunity to resume our Argentine feast was Friday night. We fired up the grill again and cooked some additional vegetables and then seared the steaks and chicken. 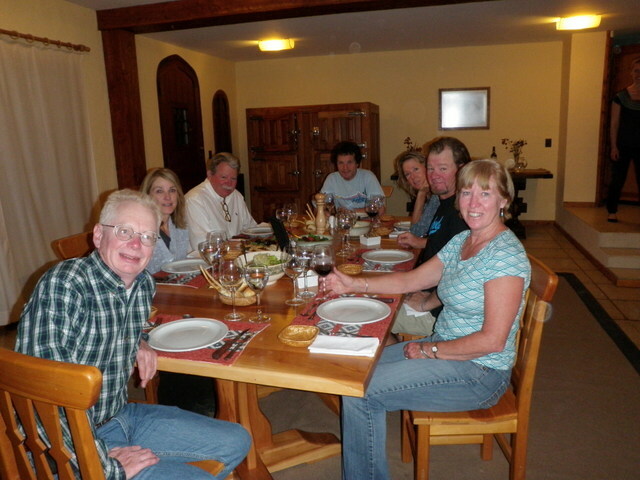 The second asado was very successful as we all enjoyed the second stage of our Argentine feast. For a first attempt at cooking new dishes, I think we fared quite well. Whether this becomes a Christmas tradition is still undetermined, but we now know not to prepare three meals when one will suffice. Sunday was our travel day, and we expected it to be a long multi-day experience. Unfortunately we had no idea how challenging it would be to return the United States. 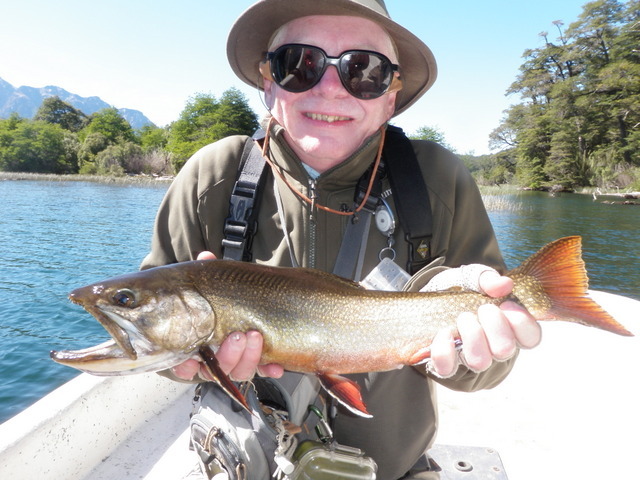 The original itinerary called for leaving Rio Manso Lodge by 1PM and arriving at the Bariloche airport by 3PM thus allowing two hours before our scheduled 5:15PM Aerolineas flight from Baricloche to Buenos Aires. Upon landing in Buenos Aires we had four hours to cross the city to Ezeiza International Airport, and then we were scheduled to depart at 11PM on an American Airlines flight to Dallas, TX where we switched planes and arrived in Denver, CO at 10AM on Monday morning. When we awoke on Sunday morning we descended to the dining room for one final breakfast. 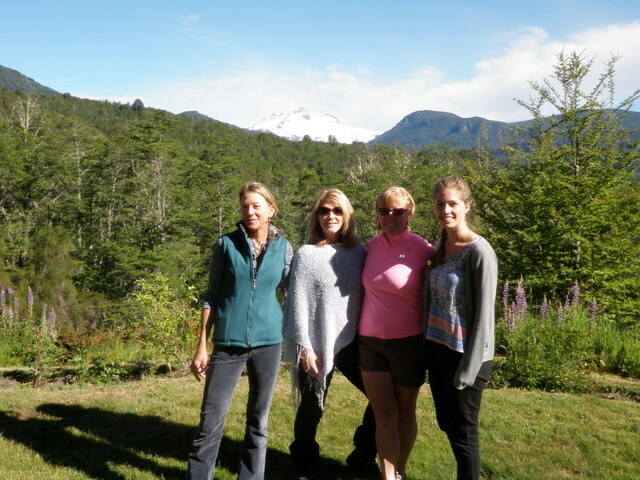 After breakfast we gathered with the California guests for final goodbyes and photos as they had early afternoon flights out of Bariloche. 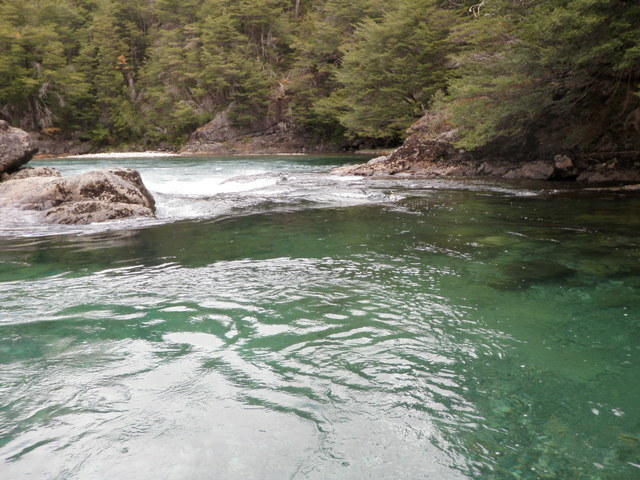 Once the other guests departed Jane and I took a hike to the first waterfalls of the Rio Manso. 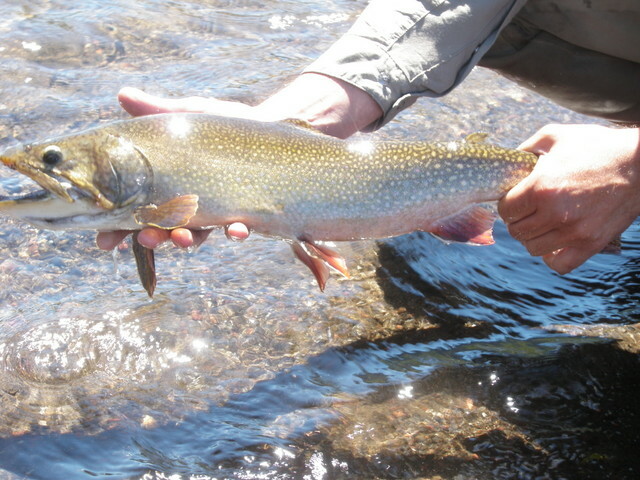 Jane had visited waterfalls 2 and 3, but hadn’t made the short walk to the first falls, and I had been fishing; and therefore, had not seen any of the waterfall attractions. 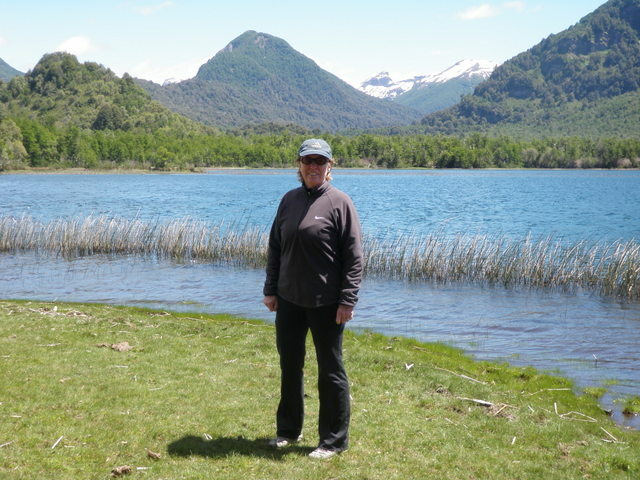 During our stay most of us had seen the huge Argentine rabbits romping about near the lodge, but for some reason Jane had not yet encountered any of these odd looking creatures. As we walked down the dirt road, a large rabbit bounded across the road, and Jane had her first glimpse. Later on our return hike an even bigger bunny galloped down the road ahead of us. 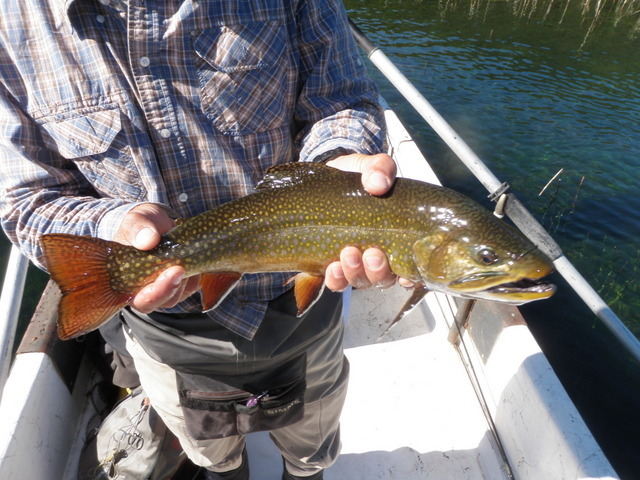 The movement of the rabbit resembled a gallop much more than a hop due to the large hind legs. At the end of the road we encountered a small dirt parking lot and a short trail that led to an overlook of the falls. The water crashed over some rocks and fell roughly 75 feet before creating a huge mass of spray and mist. 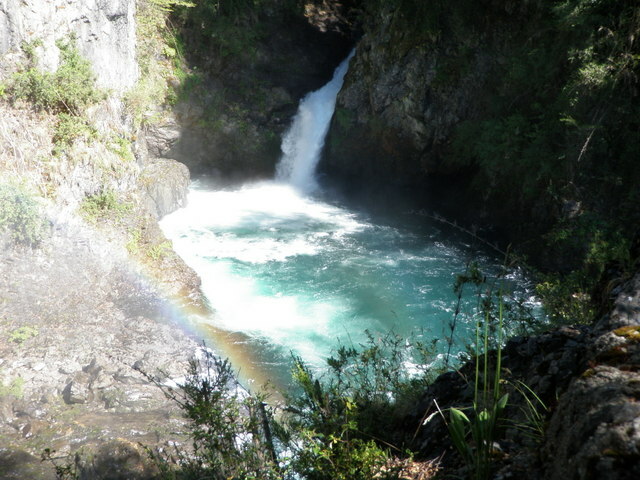 A side channel of the river diverted to one side and re-entered the main river via a much smaller waterfall, and the angle of the sun on the mist of the large falls created a small rainbow. We snapped some photos and returned to the lodge for a tasty lunch of stuffed pumpkin and a dessert of crepes with vanilla yogurt. It was a fitting final meal to a week of delectable treats. 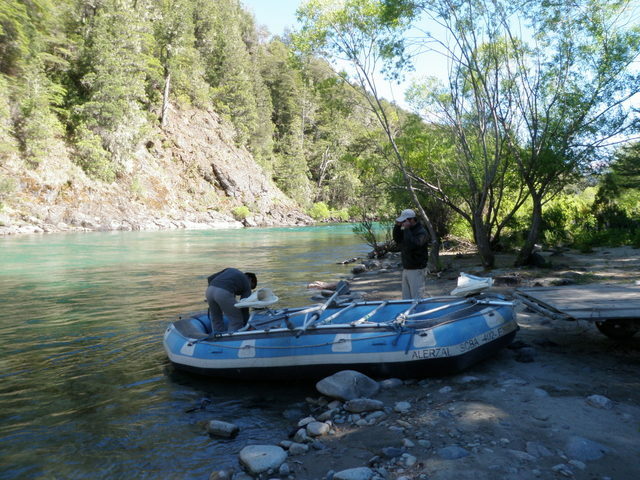 After lunch Jane and I said our goodbyes to the staff and jumped in the truck for the 1-2 hour trip to Bariloche. 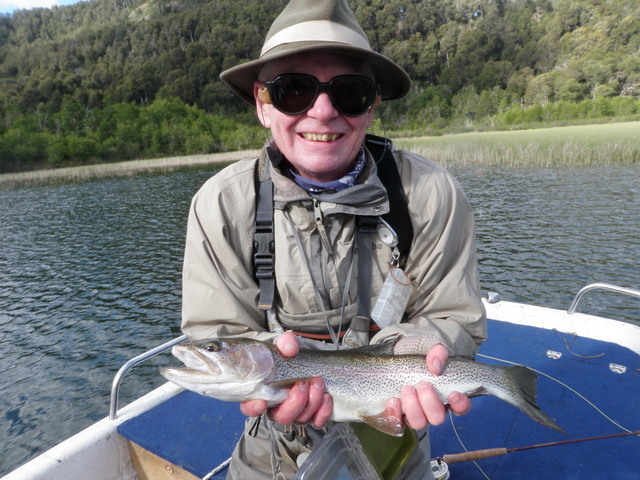 Roberto’s mother joined us, as she was receiving a ride to the home of her other son who lives in Bariloche. 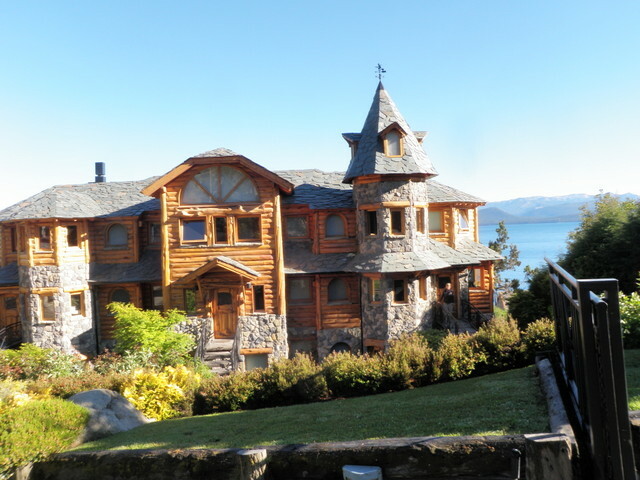 When we entered the town of Bariloche, we climbed the side of a hill until we found the brother’s house and dropped off Mom. From there Santiago, the driver, took us to the airport. We arrived in plenty of time and after checking our luggage settled back to wait for our flight. As soon as the entrance to the boarding area opened, we went through security and found the gate for our flight. At our scheduled departure time a gate agent made an announcement over the public address system in Spanish, and Jane and I didn’t comprehend the content, but we noticed concerned expressions on the faces of the other waiting passengers. Some more time passed by until it was after our departure time, and finally another announcement blasted out of the overhead speakers. This time most of the passengers stood and returned to the lobby, so we finally decided to follow suit. Eventually we found some passengers who spoke English, and they told us that the flight was cancelled, and of course there was now a long massive line waiting at the end of the check in counter to get rebooked on flights to Buenos Aires by one Aerolineas agent. The scene was rather chaotic and several tour guides pushed to the front and attempted to get their clients priority. Other Spanish speaking Argentinians crowded the counter and spoke with the agent in Spanish apparently attempting to use tactics to influence their priority. Eventually the agent used a megaphone to announce that travelers should relax as they would be called when it was their turn to obtain a new boarding pass for a later flight. Meanwhile Jane and I learned that we had to return to baggage claim to reclaim our luggage, and then we dragged it back up the stairs as there was a huge line waiting for the elevator. Waiting in line apparently is a national past-time in Argentina. Through this process we met several folks from the U.S. who appeared to be equally bewildered with the flight cancellation process. More importantly there was a young lady from Argentina who spoke some English, and I was able to befriend her and gain some useful information. Apparently the passengers were getting rebooked in order of their original check in. In addition she informed me that the agent announced that we could get free beverages at the adjoining restaurant, and after another hour of waiting she actually sought me out to pass along an announcement that we could have food free of charge. Finally after waiting for several hours, our name was called, and I went to the counter and obtained two boarding passes for an Aerolineas flight scheduled to depart at 10:30PM. We checked our bags again and went through the same gate entry and security process that we’d completed at 4:30. There was another LAN flight scheduled for 11PM, and many of the passengers from our original flight got on the LAN flight which boarded and departed before our 10:30 flight. As we waited we spotted a young boy wearing a Long Beach Island T-shirt so I struck up a conversation. As it turned out the young man had never been there, but their traveling companions were a father and son from Argentina who currently lived in Connecticut. As we waited, the father took us under his wing and helped us understand the announcements. Finally at 11PM we boarded the plane and made the two hour flight to Buenos Aires and landed at approximately 1:30 AM. Somehow we found the Aerolineas information desk and asked about lodging for the night, and they directed us to the airport information service. A young man there who spoke English recommended a nearby hotel called Aeroparke and called ahead and reserved a room for us. We found a taxi and made the short trip to the hotel where we checked in, found our room and crashed knowing that we had missed our American Airlines flight and had another travel snafu to deal with in the morning. Jane woke up before I did, and being in a distressed state, headed for the lobby with her iPad to determine how we could get home. She was unsuccessful in using Wi-Fi and Expedia, so she asked if the woman at the front desk could help, and the nice young lady complied. The female front desk employee used the hotel land line and dialed American Airlines for Jane, but when Jane spoke with the agent, she was told that we missed our flight and needed to purchase brand new tickets. American Airlines told Jane that we needed to contact Aerolineas for compensation. Jane returned to the room and woke me up with this pleasant news, so I quickly got ready and joined her in the lobby. Once again I contacted Taylor and Diana for help while I had Wi-Fi access, and then because I was concerned about moving to the airport and giving up the ability to communicate, we contacted Verizon and purchased international voice, text and data for the December billing period. As it turned out there were restaurants and cafes at the airport with free Wi-Fi, but we weren’t taking any chances. We ate a light breakfast and paid our bill, and the hotel contacted a taxi to transport us to the international airport. Once we arrived at Ezeiza we immediately headed to Aerolineas to obtain the “re-protection” that the American Airlines agent mentioned in the phone conversation with Jane. Of course the Aerolineas terminal was separate and distant from the other two terminals, so we had to push our heavy luggage along a long sidewalk, but finally we arrived at an information desk where we described our predicament. After a bit of waiting the front desk agent ushered us into a back room, and the woman there told us she was not authorized to provide compensation beyond paying for lodging or taxi costs resulting from our flight cancellation. Jane and I both reacted in frustration to this so she offered that we needed to go to Aerolineas headquarters in downtown Buenos Aires, the very location we had just left! She also provided us with a phone number to call. We left the Aerolineas terminal 3 and trudged back to terminal 1 where American Airlines was located and walked to the end of the large terminal building where a single agent stood behind the ticket purchase counter. We remained calm and polite as we explained our situation and asked when we could depart from Buenos Aires on a rescheduled flight. The young lady began banging away at the keyboard and finally announced that the earliest we could leave was midnight on Monday, and there were no available seats from Dallas to Denver, so we would need to fly to Miami and then on to Denver. She then apologized as she told us that this would require a ten hour layover in Miami! I then asked her what it would cost for this roundabout trip, and she once again typed some information and responded that it would be an additional $450 per person totaling $900. The breakdown was $200 per person penalty and $250 per person for the change in fare between when we originally purchased and now. By now we were frustrated with the entire travel experience and just wanted to return home, so we asked her to book us, but then asked if we could speak to her supervisor to appeal the penalty since it wasn’t our fault that Aerolineas cancelled our flight. The nice young agent replied that certainly we could speak to the supervisor, but she would not arrive at work until 4PM, and that was another 1.5 hours. Jane and I thanked her profusely for her assistance and found a small cafe where we ate lunch and killed time as we waited for 4PM to arrive. After lunch I attempted to dial the Aerolineas numbers provided, and after finally unscrambling the access code, country code and region code; I could not get anyone to answer the phone. We decided we’d try to deal with a refund when we returned to the U.S.
At 4PM we pushed our luggage back to the end of the terminal, and our new friend the agent was still there. We waited while she took care of some customers, and then she called her supervisor who apparently approved waiving the penalties without meeting us in person. We now paid the additional $500 for the fare change and received our tickets and then waited another 30 minutes until the check in agents arrived. A line began to form now so we positioned ourselves eighth and moved through the maze. While moving along a young Asian woman was behind us, and she had a Korean olympic logo on her luggage, so I began to converse with her. As it turns out she was a field hockey referee and coach who used to play for the Korean olympic team. Her English was fairly minimal but I did understand that she’d been to Boston in the U.S. and London, and it seemed she really loved London. Finally it was our turn to move to the counter, and we checked our three heavy bags and received our boarding passes. Could we finally be getting close to returning to our home? We still had quite a bit of time to kill, so we strolled around the perimeter of the terminal and did some window shopping. Jane’s cell phone battery was getting low, and it was the device that we had used to purchase international service, so we searched for an outlet. Ezeiza offered far fewer outlets than most U.S. airports, but we managed to find an open socket where a vending machine was plugged into the wall near the entrance. Jane and I sat down on the floor to allow the phone to charge for 20 minutes or so, and as we were waiting, we looked up and discovered Marcos and Tomas. 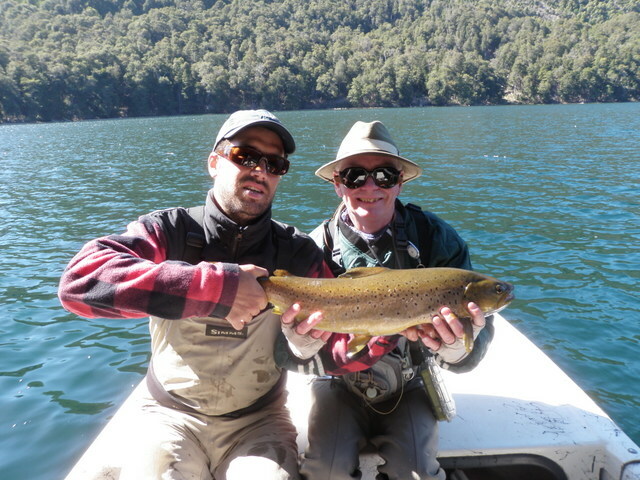 Marcos and Tomas were the father and son team that lived in Connecticut that helped us in Bariloche, and we were amazed to chance upon these new friends again. We told them of our hardships, and then I asked Marcos what he did in the U.S. and discovered that he worked for Bank of America. We also chatted with Tomas for a bit while Marcos was on his mobile phone, and the young fellow was quite impressive with his English and his poise with strangers such as ourselves. Once Marcos got off the phone, we talked some more, and I mentioned that I was from southeastern Pennsylvania near Philadelphia, and Marcos replied that he and his family lived near Philly for three years while he obtained his PHD in economics from the University of Pennsylvania. I then informed him that I graduated from Wharton with an MBA, and then I asked him what his role was at Bank of America, and he replied that he was their corporate economist for Latin America. Marcos and Tomas needed to move on to catch their flight, and we planned to eat dinner, so I gave Marcos my Saddleback Design business card and asked him to send me an email with his address upon their return. Once Jane’s phone was charged we went upstairs to check out the dining options and found a quiet spot in the corner where we rested and had a peaceful dinner. We still had some remaining pesos after paying for dinner, so we wandered over to a coffee shop and bought some alfajores to use up the local currency. Finally it was getting closer to the time of our flight, so we decided to go through security and find our gate. On our way to the gate we passed a large duty free shop so we found the gate location and then wandered through the shops for a half hour or so. The flight remained on time so we boarded the plane at 11:30PM and found our seats, but unlike the flight from Dallas to Buenos Aires, this flight to Miami was full, so there was no spreading out to sleep. Once again we slept intermittently on the long ten hour flight to Miami and arrived there travel weary on Tuesday morning. It took an hour or two to pass through passport control and then customs, but eventually we found ourselves wandering through the Miami airport in search of our gate that would take us to Denver. There were so many Spanish speaking people in the Miami airport that I felt like I was still in Argentina. We had a small breakfast on the plane before landing, but both of us were in need of tea and coffee so we searched and found a coffee shop. After breakfast we returned to an empty gate waiting area and found an outlet on a cylindrical post and charged all our electronic equipment. Our flight to Denver was at 6PM so we killed time for most of the afternoon by reading at the empty gate and having lunch at a Latin restaurant. After lunch we stopped and purchased some goodies to eat on the return flight. Fortunately everything went according to plan once we arrived in Miami, and we boarded our plane and made the four hour flight before eventually arriving in Denver by 8PM. It was quite a trip. 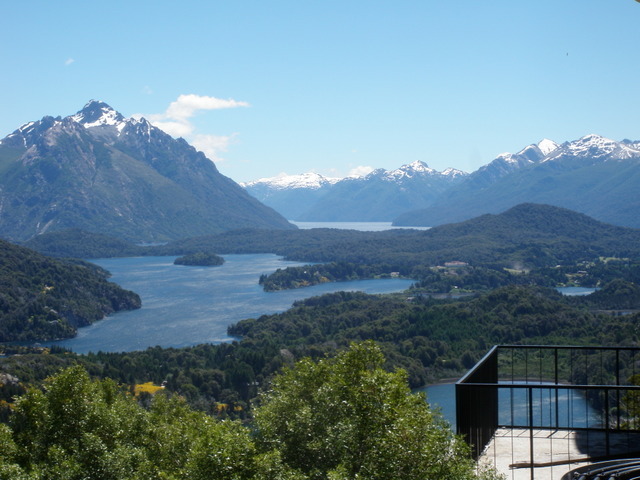 Originally we were scheduled to leave Bariloche at 5:15PM on Sunday and arrive home in Denver by 10AM on Monday morning. 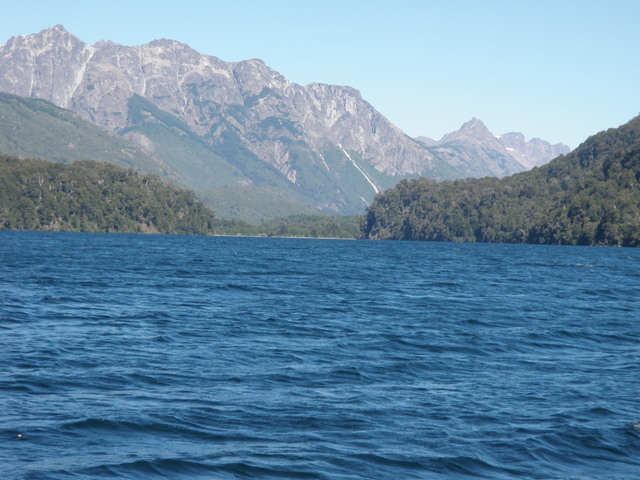 Instead we left Bariloche at 11PM on Sunday and arrived home in Denver by 10PM on Tuesday. 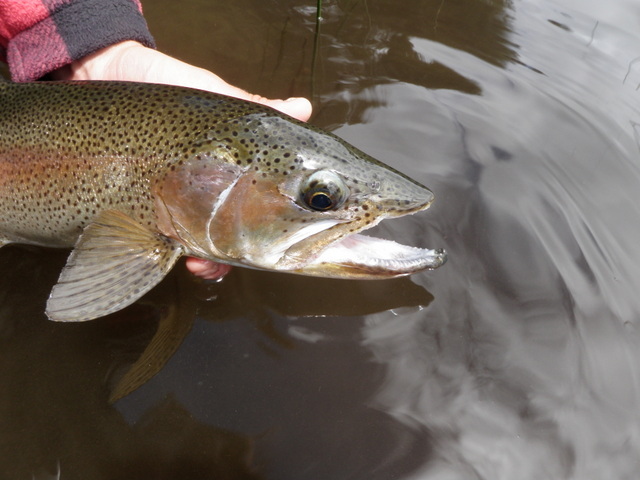 A trip that was supposed to take 3/4 of a day morphed into a two day sojourn. We were extremely happy to arrive at our home in Denver, and we almost immediately jumped into our beds. 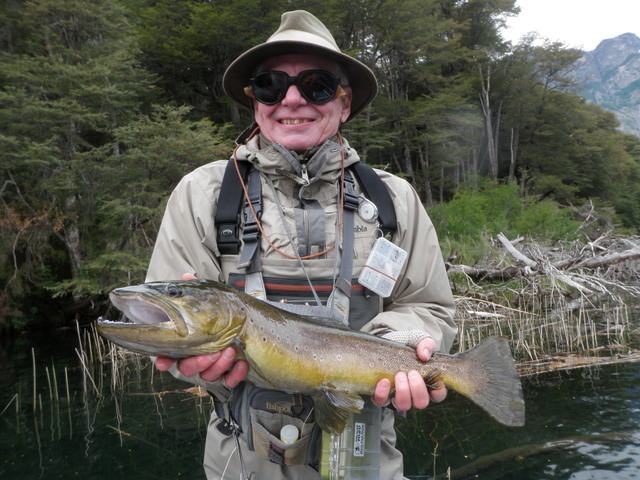 We had a great time in Argentina, but our traveling travails departing and coming home will not be forgotten soon. 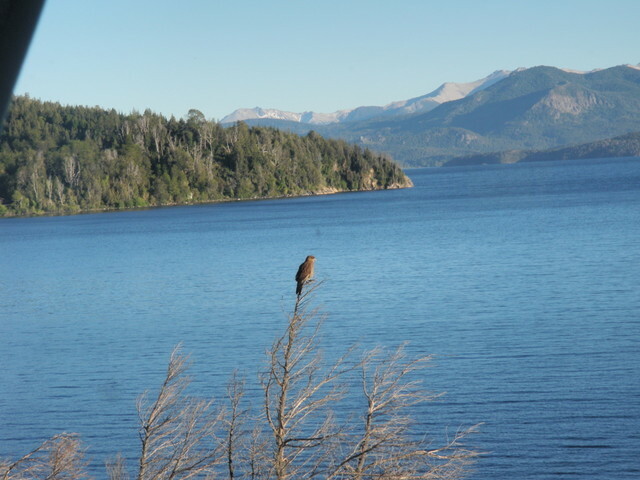 On Sunday morning we awoke to blue skies and sunshine and a hawk perched on a tree limb outside our grand window. Could this have been staged? 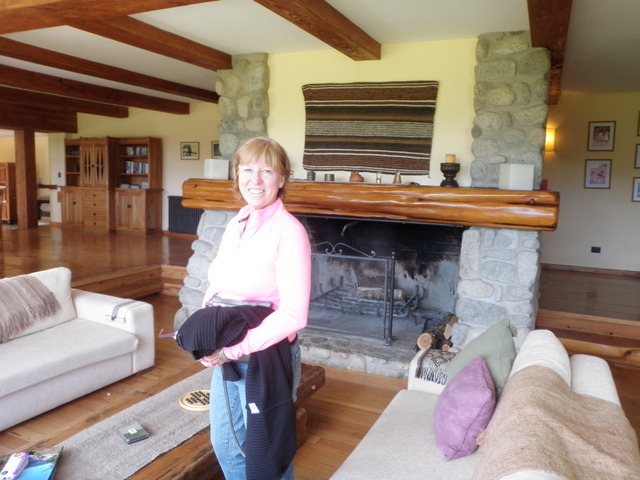 Jane and I wandered over to the dining area in the separate building near the road and enjoyed a fine continental breakfast will all sorts of pastries, fruit, yogurt and cereal. After breakfast we returned to our main lodge and roamed about the grounds. It was quite windy but we found several places with wind barriers, and the warmth of the sun was quite pleasant. We descended the steps and path and reached the edge of the huge lake which was now churning with whitecaps due to the high winds. 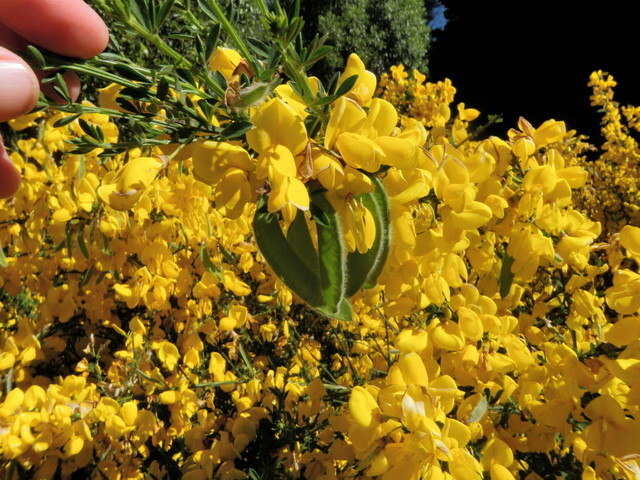 There were flowers everywhere, but the most prevalent were a yellow bush of moderate height that we later learned was called retama. 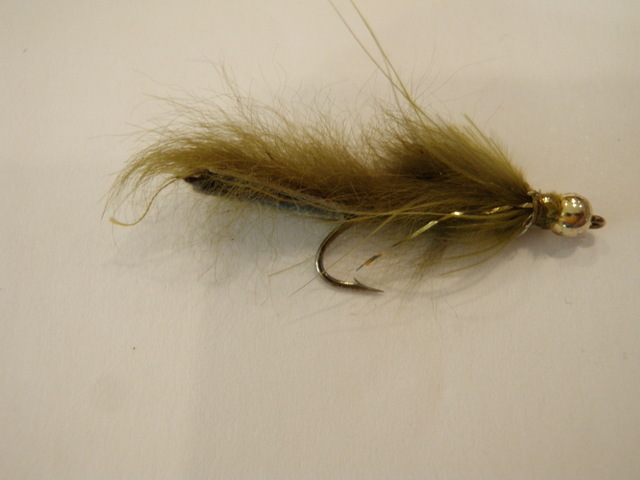 They reminded me of forsythia but strangely had small green pods on the branches. At this point we thought we were being picked up by Rio Monso on Sunday morning so we packed our suitcases and wandered over to the office. 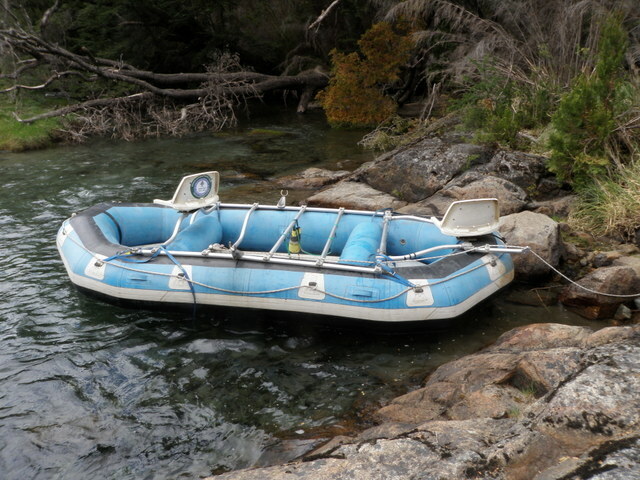 Much to our surprise the other couples that were supposed to join us for the trip to Rio Monso Lodge were no where to be found, so we began to suspect that something was amiss. We asked if the person at the front counter could contact Rio Manso, and he began to call and email his contacts. Meanwhile I used the Wi-Fi connection to send emails to Diana and Taylor. Apparently we created quite a storm and eventually Santiago, the driver who was in town to drop off departing guests at the airport, appeared and offered to take us to the lodge. By now I’d heard back from Taylor and learned that we weren’t scheduled for pickup until Monday morning, so we checked with the front desk person whether we could stay at Lirolay for a second night. 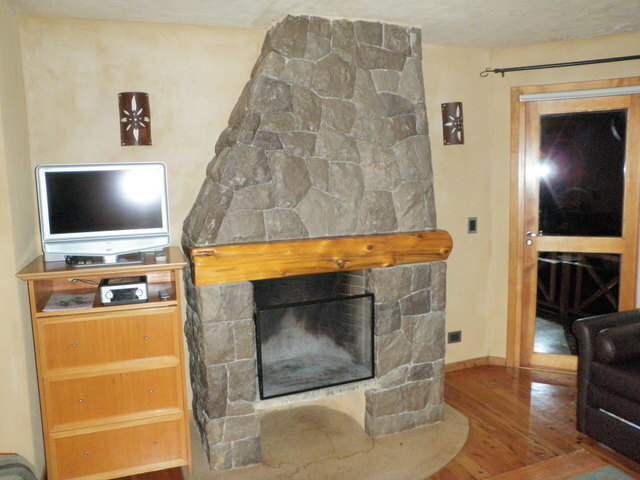 Fortunately there was a room available, the Lirolay suite, the nicest and most expensive room situated closest to the lake. 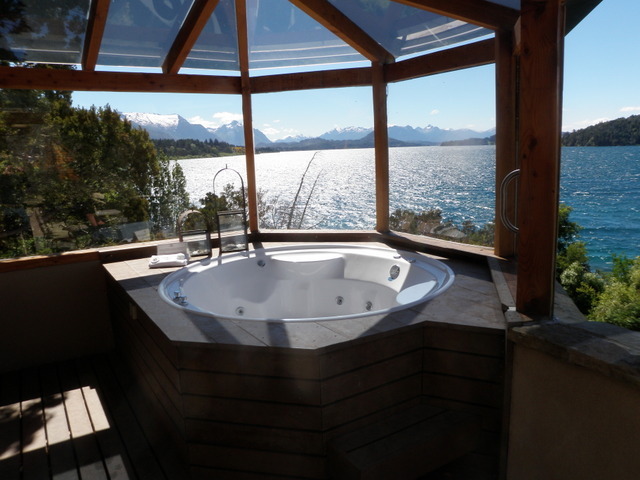 We decided to remain in Bariloche for another night and moved to our upgraded room that contained a hot tub on a deck just outside our bed. It was unfortunate that we were forced to stay another night in this luxury. 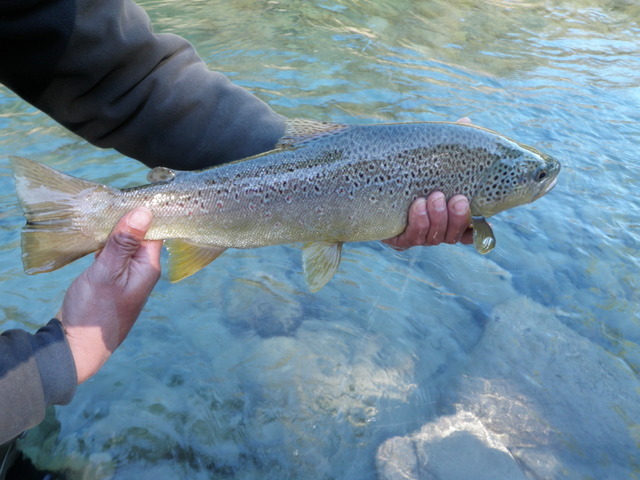 With an extra day in Bariloche ahead of us we checked back with Matis, the nice front desk person, and he suggested things to do. 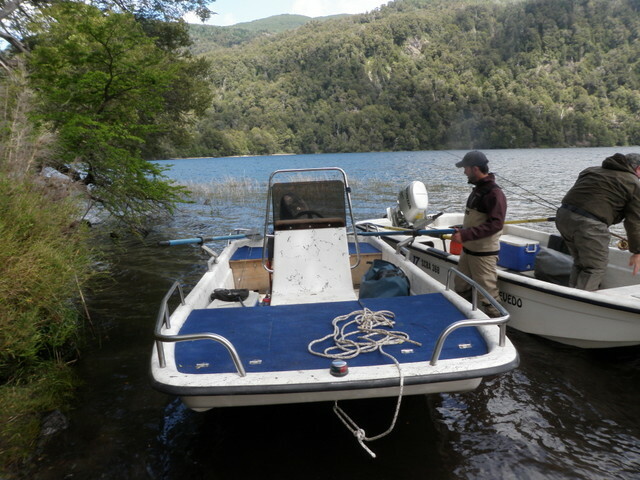 For starters we decided to hire a taxi and head to a small restaurant along the lake near Cerro Campanario. 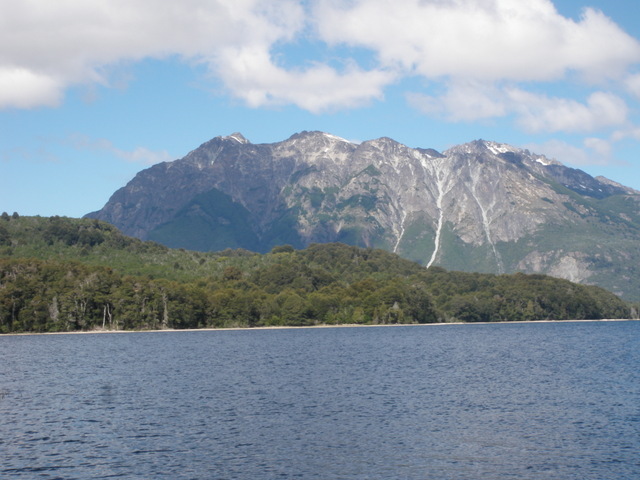 Afterward we were within walking distance of the chairlift that would transport us to Cerro Campanario where we would have scenic views of the mountains and lakes around Bariloche. Matise called a taxi for us and after a 15 minute winding ride along the lake, dropped us off at Chado, the restaurant by the lake. Jane and I enjoyed light lunches and then walked a short distance back along the road to the base of the chairlift and purchased two lift tickets. A brief pleasant ride on the chair took us to the top where we circled around the path and snapped panoramic photos of the landscape. For our return trip we decided to follow a dusty path that was visible from the chair, and as we descended we encountered numerous brave or perhaps foolish visitors making the uphill climb. At one point a young man approached in a Denver Nuggets jersey, and I stopped and told him that I was from Denver, Colorado and asked if he were a Nuggets fan? He replied in minimal English, “No Los Angeles Clippers”. Our language barrier prevented me from finding out why he was wearing a Nuggets jersey. After reaching the base we were at a loss about how to obtain a cab for the return trip, so we returned to the restaurant and asked our waiter to call one. We decided to order a dessert to validate our return, but the cab arrived much sooner than expected and we had to gulp our tea and inhale our dessert cake in order to not make the cab driver wait. After checking into our new room and being awestruck by our new setup, we decided to make a trip to downtown Bariloche to see what an Argentine ski town is like. Again the front desk ordered a taxi, and the driver dropped us off on Mitre street, the main artery through the business district. We spent an hour or two browsing the shops and exchanging money before enlisting the services of another cab and returning to Lirolay. 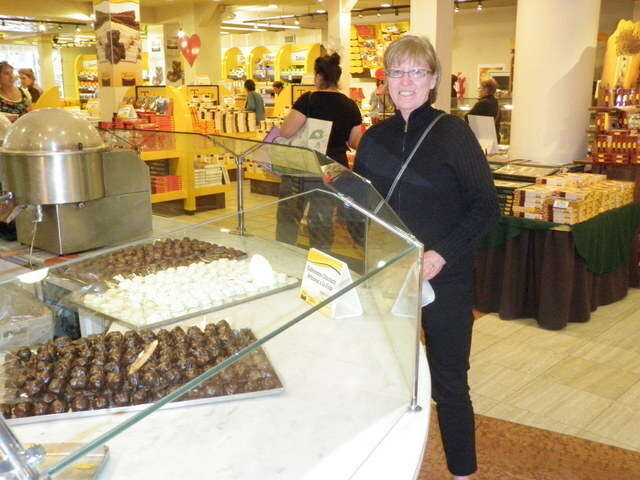 Bariloche is known as the chocolate capital of Argentina and we entered a chocolate outlet store and bought a box of candy to carry back to the United States. A restaurtant across from Lirolay Suites was recommended as one of the best in town, so we decided to make it our dining spot for Sunday night. Matise called and made reservations for us, and at the appropriate time we crossed the street and entered El Patacon parilla. There were plenty of tables and we enjoyed a fine meal before returning to our luxury suite for a fine night’s rest. 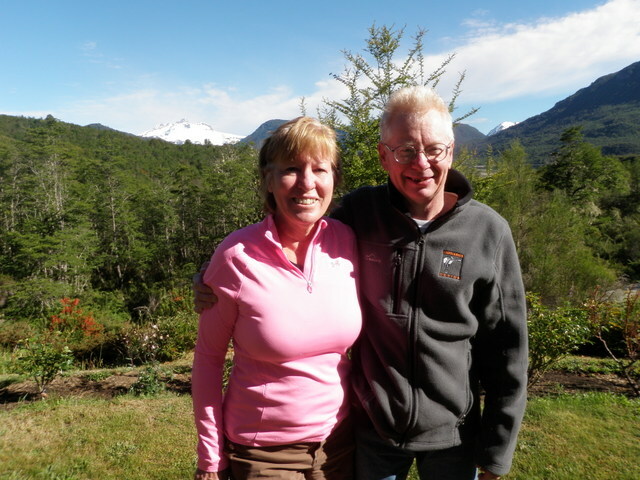 Our itinerary showed Saturday November 30 as a travel day, and Jane and I would go to the domestic airport in downtown Buenos Aires and then make a two hour flight to Bariloche, a ski town in western Patagonia. Our departure was scheduled for 6:15PM so we had most of the morning and early afternoon to continue our Buenos Aires experience. Once again we enjoyed a fine continental breakfast as part of our stay, however, the pleasant late spring weather and warm temperatures beckoned us to the small Miravida patio. After breakfast we chatted with Felipe, one of the employees involved in our email exchanges, and he was a very outgoing young man who spoke good English with a bit of a Canadian accent. We wanted to pick up some remaining gifts for friends in the U.S. and believed that soccer shirts were the perfect present, so Felipe provided directions to a shopping district with numerous sports apparel outlets. 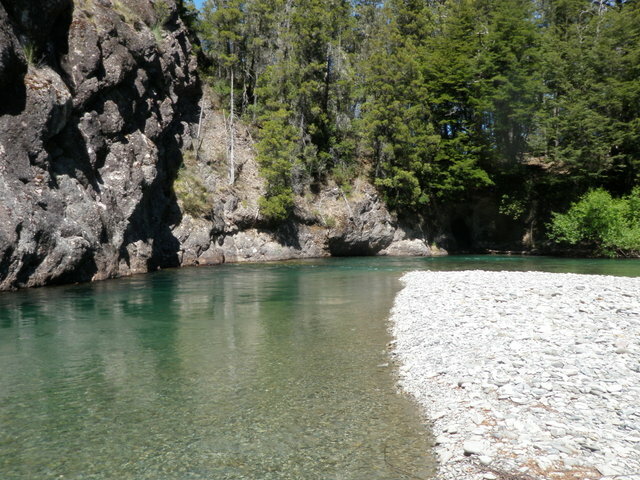 The hike turned out to be around 10-12 blocks, but we eventually found the area and browsed through five or six shops. Unfortunately we weren’t finding the desired sizes, or the shirts were too expensive, or we couldn’t find the right team, so we abandoned the soccer shirt approach and decided to instead purchase some Argentine candy. In the morning before leaving we asked Felipe if there was a favorite Argentine candy, and he responded with no hesitation that alfajores were clearly the answer. He wrote down four brands to look for, and he actually grew quite animated at the thought of eating this sweet treat. 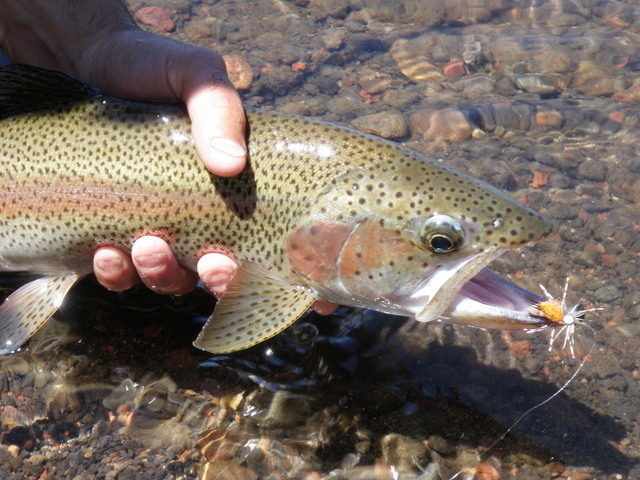 We had the slip of paper with us, so we shifted our focus from sports apparel stores to grocery stores as we returned back toward the Miravida. After a few blocks we encountered a small grocery store and entered and in a short amount of time discovered a rather extensive display of alfajores near the check out lanes. There were chocolate and vanilla and numerous brands including two of the types listed on Felipe’s slip of paper. 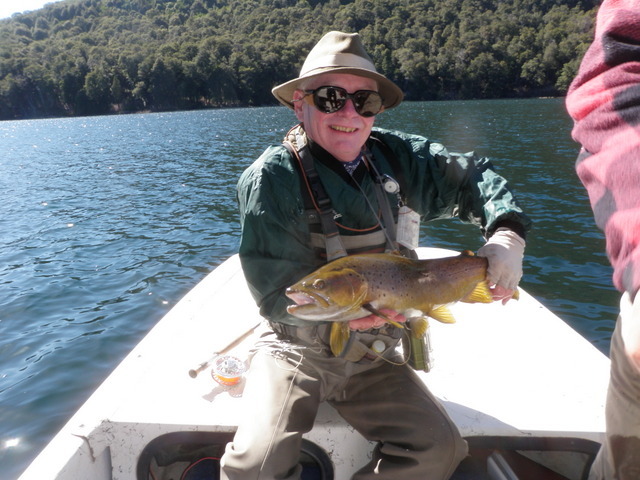 We grabbed several packages of one of his listed varieties and offered the correct pesos and rejoiced at having achieved our gift buying goal before leaving Buenos Aires. It was now late morning and the air temperature was approaching 24 degrees celsius, or 80 fahrenheit so we decided to return to the hotel for a bit and then resume our gift hunting venture. Once again Felipe was at the front desk, and again he was extremely helpful. 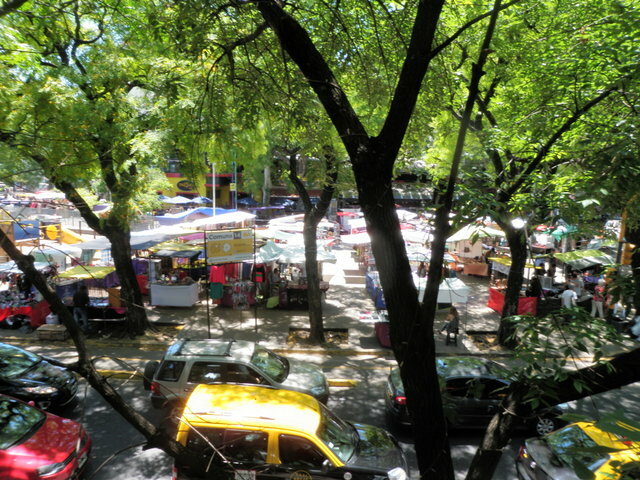 We were seeking another open air market where we could find craft gifts, and he immediately directed us to Plaza Serrano. Off we went again, but this walk was only five blocks and as we looked ahead we saw the square surrounded by small kiosks where craftsmen displayed their products. Situated on the outside of the plaza were many small cafes and bars with patio seating, so this looked like an interesting place to spend some time. Unlike La Boca the crowd appeared to be largely local Argentines and not tourists. We browsed through the small craft stands and settled on a booth with unique crafted products and purchased a few items for ourselves and also as gifts. 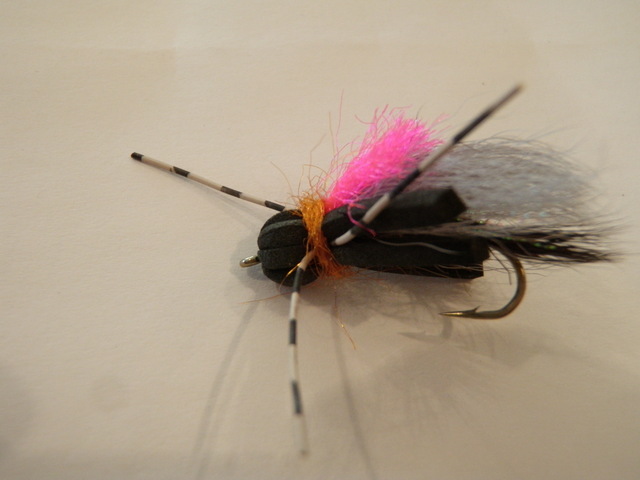 We now had Argentine gifts for all the friends and family members on our list, so our thoughts turned to lunch. We looked up from the west end of the plaza and noticed a cafe on the second level that overlooked the entire market and surrounding area, and we both decided this would be an ideal spot for a light lunch. After entering the building we found the stairs and climbed to the second floor where we were seated at a table with an umbrella shading us from the warm sun. Shortly thereafter a pair of women arrived and after claiming a vacant table next to the balcony rail, they approached us and spoke in Spanish. We offered the two seats next to us, but for some reason they declined and returned to their previous seating. A bit of time elapsed when we finally realized that they had a third person in their party, and they were asking to exchange tables with us. Once we understood their request, we quickly swapped tables and ended up in a more desirable location overlooking the plaza. 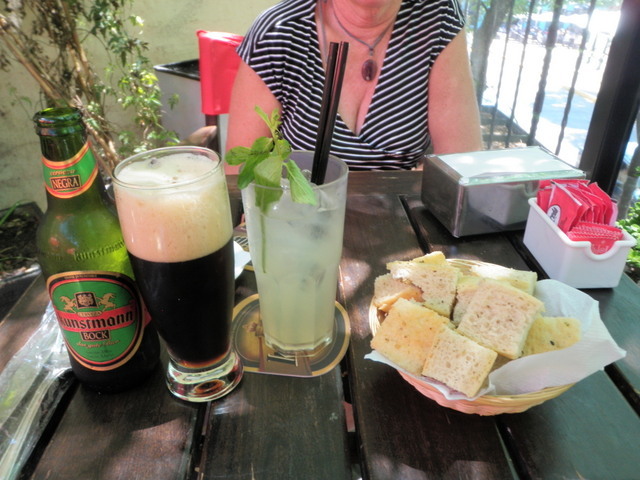 I ordered a German boch beer and Jane discovered a thirst quenching mint flavored lemonade, and then we ate some large salads and returned to the hotel. 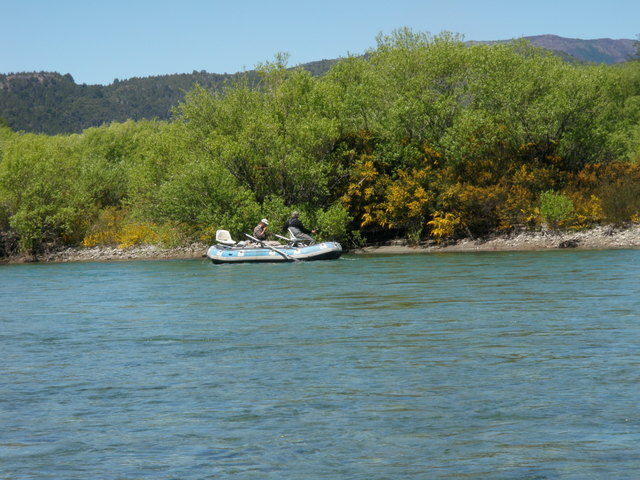 We now had a few hours to pack and chat before our taxi was due to pick us up and take us to the Aeroparke for our flight to Bariloche. 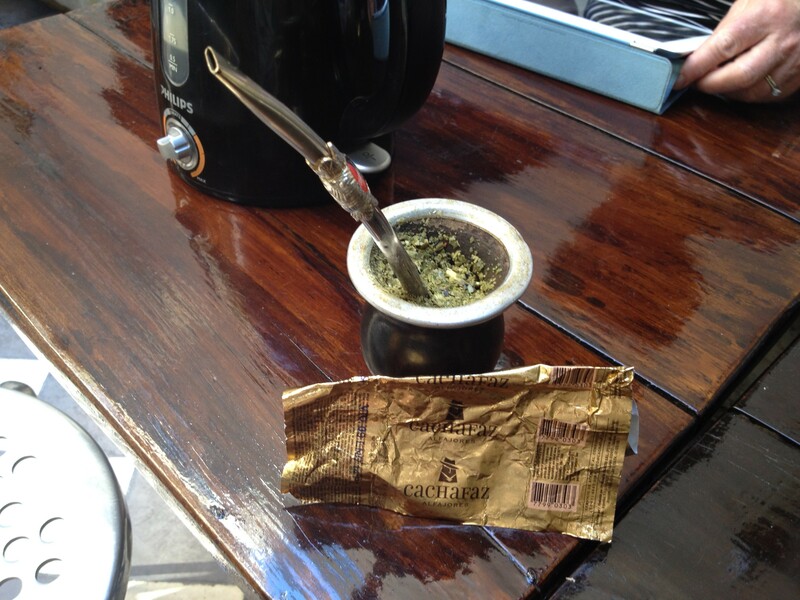 Somehow I mentioned yerba mate to Felipe, and he invited us to join him in a mate tea party. Jane and I walked to the patio table and in a brief amount of time Felipe arrived with his mate gourd. The mug is in reality a hollowed out gourd with a metal rim and upon close examination one could still see the rough membrane on the inside surface of the vessel. A metal straw was positioned within the mate mug and Felipe began to explain the tradition of mate. He described drinking mate as a social event involving the owner of the cup and his or her invited guests. The process began by filling the mug with a thick concoction of light green herbs. Unlike normal tea that is contained in a bag or infuser, the loose herbal mix completely filled the container. Next to the gourd was a pitcher with hot water, and Felipe made it clear that the water should be heated until it was just below boiling. In fact the pitcher on our table had a mate setting. Felipe picked up the pitcher and filled the cup to the top and all the dry herbal mixture absorbed the hot water. As we looked on, Felipe cautioned us that it was not polite to touch the metal straw anywhere but the top with your lips, and it was also tradition that the owner of the mug should take the first drink as this was the most bitter. With this information now communicated, Felipe took the first sips of mate until all the liquid was withdrawn and then refilled the cup and handed it to Dave. Dave put his lips on the hot metal straw and sucked as much tea as he could from the green mash and then passed it to Jane. Once more Felipe topped off the mate mix with water and Jane took her turn at the straw. We made one full round and then Felipe and Dave took a second drink and we ended the mate ritual. 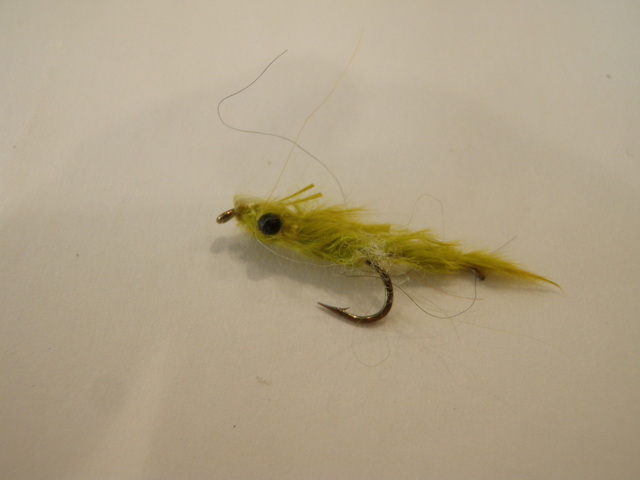 It was fun to be introduced to a South American tradition in this way. 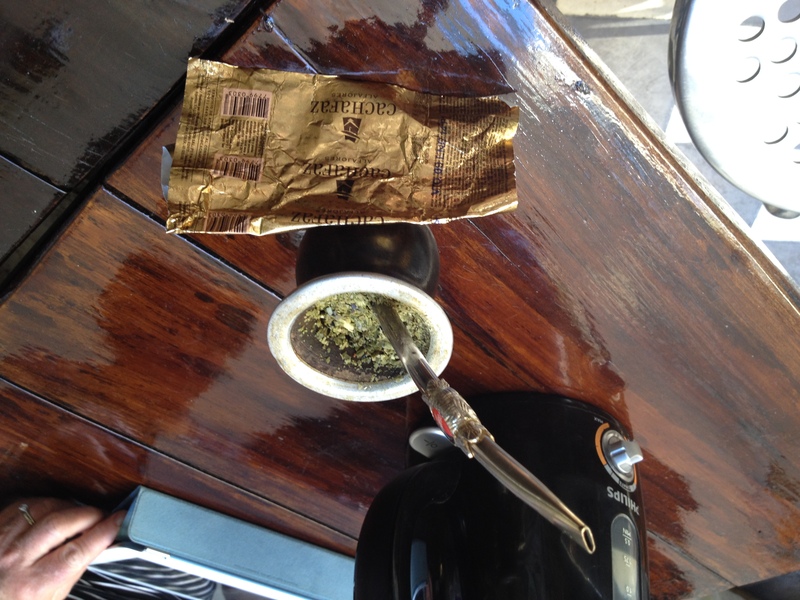 The flavor of mate was somewhat bitter and clearly was an acquired taste in my opinion. With time remaining before our departure to the airport I asked Felipe about the standard of living in Paraguay as I remembered it to be one of the poorest countries in South America from my social studies class in sixth grade, but I’d lost track of the landlocked country since then. During our mate discussion Felipe mentioned that he grew up in Paraguay, and my question prompted a fascinating history lesson. Unbeknownst to me, Paraguay had a golden age in the early 1800’s before the U.S. civil war. According to Felipe the British government then instigated a war between Paraguay and Bolivia, Brazil and Argentina and the result of this mismatch is fairly easy to predict. Paraguay lost and then Brazil and Argentina took control of land and shrank the size of Paraguay to its current state. After the war the country went through a long period of unstable government and dictatorships culminating in the 35 year rule of Alfredo Stroessner. Felipe contends that even today the government is corrupt and accepts bribes from foreign multinationals such as Monsanto and Rio Tinto to exploit the land and natural resources. Felipe was certainly one of the favorite personalities that we encountered on our trip. 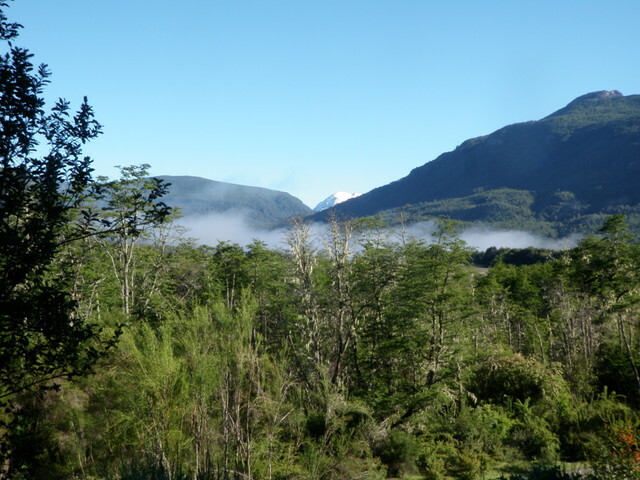 Our departure hour had now arrived and a taxi arrived at the door once again so we crawled into the back seat and enjoyed a normal ride to Aeroparke, the domestic hub. When we checked our bags we were informed that our cumulative kilograms were 20kgs over the allowable weight, so we were sent to the cashier to pay for the overage. The woman at the check-in counter gave me my boarding pass but withheld Jane’s until the $14 fee was paid. We walked down the wide hall a ways and found the cashier window with a long line extending through a maze. Did we need to wait in this line to pay our $14 so we could obtain Jane’s boarding pass and make our flight to Bariloche? We were beginning to fidget and stress over the likelihood of another travel snarl, and making things worse were three large men who stood in front of the one cashier window speaking loudly in an attempt to outshout each other and the man behind the window. Would this never end? Finally another man arrived and told us he waited unnecessarily in the long line as that line was for purchasing tickets. Once we heard this we heaved a sigh of relief and jumped behind our new friend and in a short amount of time we paid our fee and possessed Jane’s boarding pass. When we arrived at the gate we discovered that the flight was a half hour late, so we actually had more time than we realized. 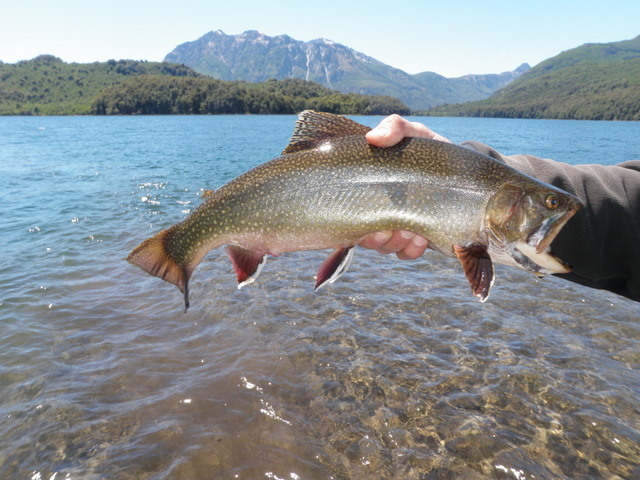 The rest of the day unfolded pretty much as planned, and we landed in Bariloche at 9PM. We had arranged through Lirolay Suites for a transfer from the airport, and as we emerged from baggage claim a young taxi driver held a sign with our names printed on it. 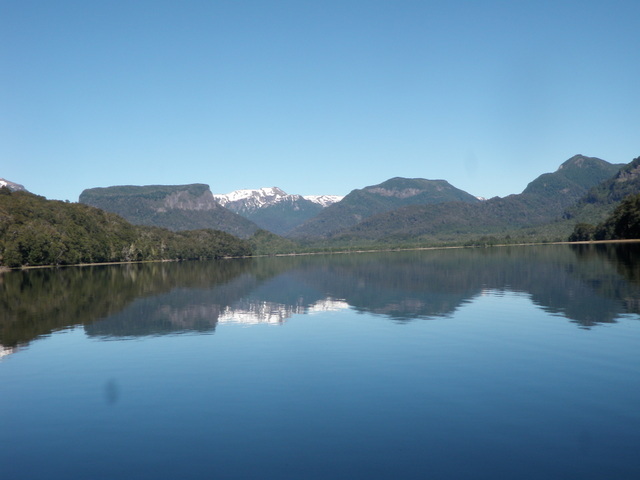 We greeted our driver and joined him for a fairly long ride from the airport to Lirolay Suites along Lago Nahuel Huapi because the airport was in a rural location far outside the small city, and the hotel was on the opposite side of the city. 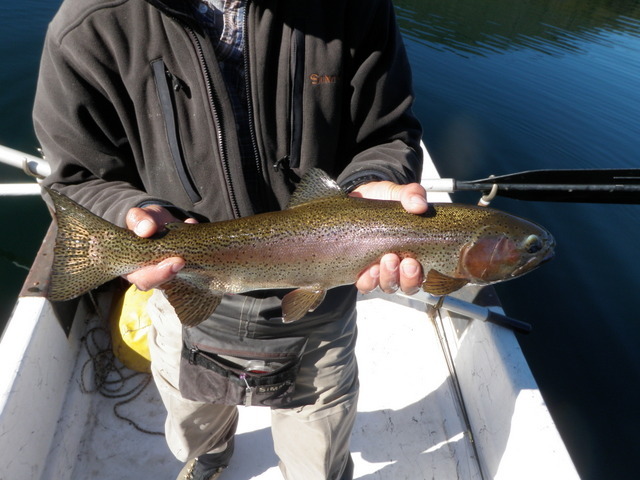 We were quite hungry so after Francisco checked us in to our suite, we returned to the front building and ate a nice dinner of salmon and trout in the dining room adjoining the office. Our waitress Maria was very nice, and the cook eventually came out to ask us how we liked our meal, and we had a nice conversation with him before paying our bill and returning to our room. 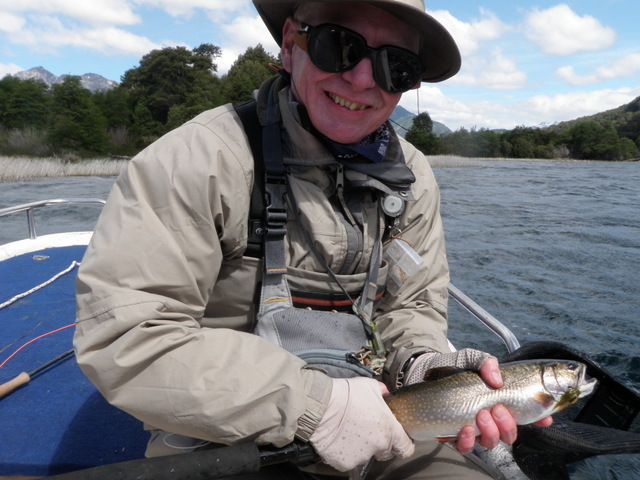 We were now in Patagonia and poised for a week at Rio Manso Lodge.